The Peoria and the Tri County real estate market is highly competitive. Having your property priced right is critical to selling your home in a reasonable period of time. It is essential to understand what your home is worth to help you decide whether or not to sell, how to price your property, and whether your property is holding its value. 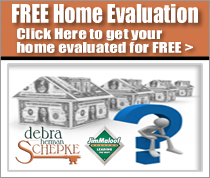 I can provide you with a free market evaluation of your property. Please fill out the form below and I will be happy to contact you to schedule an appointment my earliest opportunity. What date would you like to start listing. Please provide me with a brief description of your property.